Lt Col. James H. Doolittle confers with Capt. Marc A. Mitscher on the bomber-laden deck of the USS Hornet. On April 18, 1942, as the fateful day of April 18, 1942 approaches. On the stormy morning of that date, Doolittle would pilot the first of sixteen specially-modified B-25 bombers to lift off the Hornet to strike military targets on the Japanese home islands, giving America and its allies a badly-needed morale boost in the wake of destruction at Pearl Harbor. gave America and its allies a badly-needed morale boost in the wake of destruction at Pearl Harbor. The plan was to strike Japan, and then land the B-25s at predetermined airfields in China. Due to being discovered early however, the planes were forced to launch earlier than planned, meaning they would run out of fuel before reaching their destinations. Most crews bailed out, a few made water landings, and one crew diverted to land in Vladivostok, Russia, where they were interned by their Soviet “allies”. Eight men were captured and tortured by the Japanese, who executed three following a mock trial. Four of the POWs survived to return home. The thrilling story of Doolittle’s Tokyo Raiders is one of World War II’s most famous and valorous aviation missions. The painting The Hornet’s Nest was completed in 1994, and was the first major aviation print by John Shaw. The lithograph edition was produced as a fund-raiser for the Central California Historical Military Museum, located at Eagle Field in central California, originally a WWII Primary Trainer base. A sizeable group of original Doolittle veterans signed this original edition in Fresno, California in 1994 and 1995. In 2006, the British publisher Military Gallery hosted a group of Raiders in England, which was their first official gathering as a group in the UK, and by special request, a smaller-sized commemorative print was produced in a smaller UK edition. 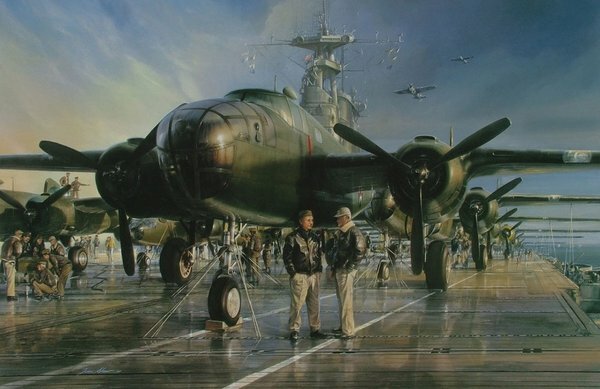 This painting has also been featured in a number of books and periodicals to illustrate articles on Jimmy Doolittle and his famous Tokyo Raiders.